October 22-23 TRIPOLI (Reuters) - South African President Nelson Mandela, sternly dismissing U.S. reservations about his mission, arrived in Libya on Wednesday for a visit described by diplomats as the most important for Muammar Gaddafi since the United Nations clamped sanctions on his nation in 1992. Mandela, his Mozambican companion, Graca Machel, and Foreign Minister Alfred Nzo arrived at the Libyan border town of Ras Adjir by helicopter from the nearby Tunisian resort island of Djerba and drove across the frontier and 160 km (100 miles) to Tripoli. The trip was made by road because of an air embargo imposed on Libya by the United Nations. Mandela's 50-vehicle convoy passed under a series of welcoming banners, including one that set the tone for his visit saying: "Mandela's visit to Libya is a devastating blow to America." 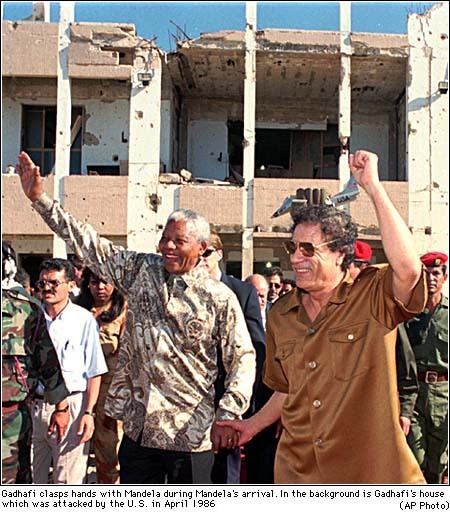 After a triumphant cavalcade around downtown Tripoli, Mandela, 79, was greeted by Gaddafi outside the ruined home in which the Libya leader's daughter, Hana, was brutally killed in a U.S. air raid more than 10 years ago. Greeting Gaddafi with a hug and a kiss on each cheek, Mandela told him: "My brother leader, my brother leader. How nice to see you." Shortly afterwards, he told reporters he remained unimpressed by U.S. opposition to his mission, adding: "Those who say I should not be here are without morals. I am not going to join them in their lack of morality." Mandela said he had spent 27 years in jail rather than abandon his principles under pressure and said he felt the same way about his debt to Gaddafi and the Libyan people for their support in the struggle against apartheid. "This man helped us at a time when we were all alone, when those who say we should not come here were helping the enemy (South Africa's white government)," Mandela said. He reiterated South Africa's policy on the sanctions imposed by the United Nations to force Libya to hand over two suspects in the 1988 bombing of Pan Am Flight 103 over Lockerbie, Scotland -- saying a way should be found to lift them. Mandela said South Africa supported the Organisation of African unity's call for a trial in a neutral third country. He said he would seek to promote a resolution of the stalemate between Libya and the United States and Britain at the Commonwealth summit in Edinburgh next week. "It would be premature now to say exactly how we are going to search for a solution. (We) feel that to maintain these sanctions is to punish the ordinary people of Libya and that is why there is now great concern that the remaining sanctions must be lifted," he said. ine with its policy of discouraging trade or diplomatic relations, on Monday renewed its objection to Mandela's visit. "We would be disappointed if he decided to make such a trip. To give(the Libyans) any solace at a time like this would be unfortunate," said U.S. State Department spokesman James Rubin. Ebrahim Saley, South Africa's ambassador to Tunisia and Libya, told Reuters, however, Libya had offered Mandela's ANC consistent moral support throughout the 30-year armed struggle against white rule in South Africa, including training and financial backing that helped the party to sweep apartheid into history. 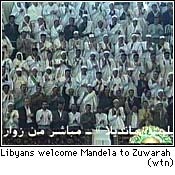 Mandela visited Libya twice between his release from jail in 1990 and his election as South Africa's first black leader in 1994, but has not been to Tripoli since becoming president. Abdalla Abzubedi, Libya's ambassador to South Africa, told Reuters the visit would focus on regional peace-making efforts and bilateral trade. Asked whether the Lockerbie issue could be raised, he said: "President Mandela always makes a difference to any international issue - especially in Africa." Mandela not to mediate for Libya in Edinburgh ? South African President Nelson Mandela said Friday he would not use his visit to a Commonwealth summit in Edinburgh to mediate in a four-year stand-off between Libya and the governments of Britain and the United States. He did say he would meet relatives of those Britons killed in a 1988 bombing of a Pan Am airliner over the Scottish town of Lockerbie, an attack which is blamed on two Libyan agents. Mandela arrived in Edinburgh after talks with Libyan Revolution leader Muammar Gaddafi on the protracted row with the West, which is demanding the extradition of the two suspects. "I am not here to negotiate on Libya. I am not here to negotiate with anyone at all, I am not here on behalf of Gaddafi," he told reporters. 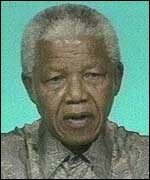 Mandela supports Gaddafi's call for the two suspects to be tried in Libya or a neutral country. Mandela said he planned to meet Dr. Jim Swire, head of an organization which groups the relatives of the British victims. "My officials are arranging a meeting with Dr. Swire and the families," he said, but declined to give further details. Speaking at a news conference in Scotland -- where he's attending the Commonwealth summit -- Mr Mandela said justice would not be seen to be done if the men were tried in Britain; no country should be complainant,prosecutor and judge. "I have never thought in dealing with this question that it is correct for any particular country to be the complainant, the prosecutor and the judge at the same time," . President Mandela said some of the victims' families had come round to the idea of a trial in another country. The meeting, coming so quickly on the heels of the last one, prompted speculation that the South African president was trying to mediate an end to the 5-year-old U.N. sanctions against Libya. 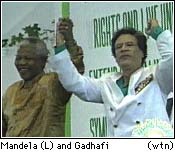 Mandela was accompanied by foreign reporters, so his visit gave Gadhafi a platform to heap scorn upon the United States. As with his previous stop in Libya, and earlier visits to Cuba, the trip demonstrated Mandela's willingness to risk U.S. wrath in maintaining close relationships with old friends. Libya and Cuba were among the countries that provided early backing to Mandela's African National Congress in its struggle against apartheid in South Africa. At a brief welcome ceremony with bagpipes, a guard raised a red Scottish tartan-plaid umbrella over Mandela's head Wednesday to shield him from the sun. The two leaders linked hands as they walked toward a tent for a five-minute meeting. Libya used the gathering to lash out at Washington. ``Down, down U.S.A., the enemy of the peoples!'' said one banner, in English, at the sports center where the ceremony was held in the seaside town of Zuwarah, 60 miles west of the capital, Tripoli. At Wednesday's ceremony, a crowd of some 3,000 burst into rhythmic applause as Mandela draped a sash across Gadhafi's chest and presented him with South Africa's Order of Good Hope, that country's highest honor for foreigners. ``Increase the struggle!'' the crowd chanted. A 21-gun salute and military parade greeted Mandela and Gaddafi when they arrived at a sports stadium in a cavalcade of limousines. Three of Gaddafi's women bodyguards, their gold bracelets glinting in the sun, smiled for the cameras while clutching their guns. Libyan tribesmen on camels mingled with dancing, ululating women whose patriotic songs were punctuated by police sirens and the shouts of officers prodding people into line with machineguns. "Welcome Mandela, the tough rebel and the stubborn resister who was not threatened by challenges and threats," the TV announcer said as Mandela greeted guests. At times, the crowd chanted in English, "Long live Mandela!" Mandela, however, made no direct references to Lockerbie in his brief remarks and said he was only in Libya to present the award. For his part, Gadhafi remained defiant. ``Asking Libya to hand over its citizens to America or Britain is a silly matter that makes us laugh, especially after the price we have had to pay,'' he told a news conference after the awards ceremony. In Washington, U.S. officials said the Clinton administration position on Pan Am flight 103 and on maintaining sanctions against Libya remain firm. They also said they were unaware of any initiative led by Mandela to mediate the issue. Gadhafi said the United States and its allies were ``punishing the whole world'' with sanctions against Libya. The 79-year-old Mandela arrived by car from neighboring Tunisia so as not to violate the U.N. sanctions. Pictures of the South African leader were plastered on shops and houses lining the 40-mile road from the Tunisian-Libyan border to Zuwarah. South African and Libyan flags adorned the sides of buildings. In response to US State Department criticism of his visit to Libya on October 23, South African President Nelson Mandela has accused the US administration of racism and condemned its ``arrogance to dictate'' where South African leaders should go. US officials had attempted to pressure Mandela into cancelling the visit, arguing that ``governments should have the lowest possible diplomatic contact with the government of Libya'' and proclaiming that they would be ``disappointed by any ratcheting up of South African-Libyan relations''. Mandela said his visit fulfilled a moral commitment to Libya, which ``supported us during our struggle when others were working with the apartheid regime''. The US government said Mandela's response to its warnings was ``unfortunate''. This is just the latest attempt by the US to force South Africa to cede to US policy in relation to governments it considers ``troublesome''. Libya, along with Cuba, Iran and Syria, is top of that list. In 1995, a proposed deal involving the storage of Iranian oil in South Africa was scrapped under pressure from the US. Soon afterwards, ``concerns'' were raised in the US Congress about South Africa's relations with Cuba. The following year, discussions about a possible arms deal between South Africa and Syria were cancelled after strong condemnation and threats from the US. The US campaign against Libya began when the September 1, 1969, revolution overthrew the US puppet King Idris, refused to renew foreign base agreements and nationalised US, French and British oil interests. Since then, the US and its allies have waged a covert and overt war against Libya, including a series of CIA-orchestrated assassination attempts, provocative incursions into Libyan territorial waters and the bombing of Tripoli and Benghazi in April 1986. In 1992, the UN Security Council imposed sanctions on Libya which prohibit arms sales and flights to and from the country. These sanctions were ostensibly to punish Libya for so-called terrorist activities and to force it to extradite two Libyan agents accused by Britain and the US of the 1988 bombing of Pan Am flight 103 over Lockerbie in Scotland, which killed 270 people. The British families of those killed in the Lockerbie disaster have welcomed Mandela's call and endorsed South Africa as a suitable venue for a trial. The South African government has further angered the US by supporting the OAU's demand that the UN lift the sanctions against Libya. 31-October 1997 A TOP Department of South Africa's Foreign Affairs lawyer has backed President Nelson Mandela's controversial stance on Libya, advising him to support Moammar Gadaffi's refusal to hand the Lockerbie bombing suspects to Britain and the United States. The department's chief legal adviser, Albert Hoffmann, told Mandela's office that according to international law, Libya was right to refuse to hand over the suspects accused of the bombing of a PanAm jumbo jet in 1988. "The United Nations is deliberating on a permanent international criminal court and were this in place, it would have provided a way out." Hoffmann said Libya had complied with the 1971 Montreal Convention to Suppress Acts of Violence against Civil Aviation, by arresting both suspects in Libya and setting up a local investigation. He said the US and the UK had rejected international treaty obligations in favour of security council resolutions to try to pressure Libya to hand over the suspects. Hoffmann, in his advice to Mandela, suggests solutions that include pursuing negotiations beyond the impasse. He suggests setting up a special ad hoc criminal tribunal to prosecute the suspects. The parties in the dispute would then agree to the composition of the tribunal and it would adopt its own rules of procedure. South African Mail&Guardian, October 31, 1997.